Articulate Engage offers two ways to add audio to an interaction. In this tutorial, we'll look at how to import audio files and how to record narration directly in Engage. Click the Import audio file button (looks like a speaker icon) in the Audio panel on the right side of the screen. When a step has audio, you'll see the word Ready in the Audio panel along with the number of seconds of audio. 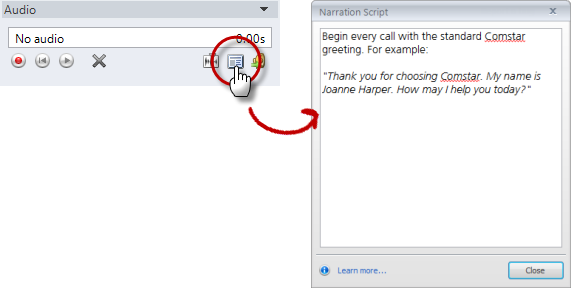 If you'd like to use a script to help you record, click the Narration script button in the Audio panel on the right side of the screen. Enter the text for your script in the window that opens. Your script will be saved, so you can revisit it later. When you're ready to record, click the red Record button in the Audio panel. When you've finished recording, click the blue Stop recording button. You can preview your recording, using the Play/Pause and Rewind buttons. If you change your mind about recording narration and would prefer to import audio instead, click the Import audio file button. Browse to the audio file you want to use, and click Open. If you want to edit the audio you just recorded, click the Edit audio button to launch the built-in Audio Editor. For information on using the Audio Editor, see this tutorial.